Tropic Splash eliquid is a blend of fruit flavours. From first inhale you’ll experience a sweet taste thanks to ripe pineapple, swiftly followed by passionfruit and a tart orange. If this flavour mix wasn't enough, Cosmic Fog have added a secret island fruit to create a tangy finish. Sour Melon eliquid strikes the balance between, that’s right you guessed it - sweet and sour. A sugary and fresh tasting watermelon flavour will hit you as soon as you open the bottle and it has a taste to match. 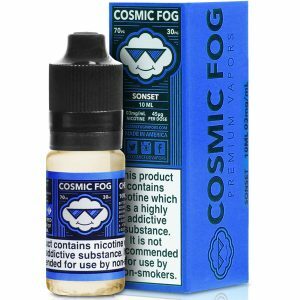 Paired with a sour hard candy, Cosmic Fog have created a balanced and punchy flavour combo. Berry Trio eliquid, has white, red and golden raspberry flavours - creating a very sweet and complex fruit base to this ejuice. 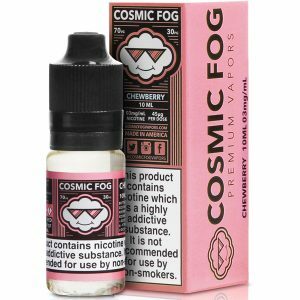 If that wasn’t enough Cosmic Fog have added huckleberry to this juice giving it a sweet and slightly tart finish. The Shocker eliquid will surprise you in more ways than one. It starts with a sharp and tangy lemonade flavour base, that could be an ejuice in it’s own right. 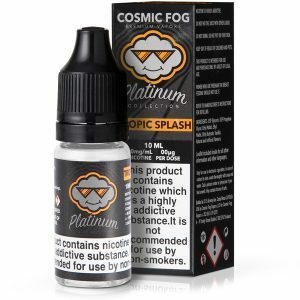 Cosmic Fog made the wise decision to pack this vape liquid full of fruit; a medley of apples, mangoes and strawberries; help to create a tart and sweet flavour. Sonset eliquid will help you bring the day to a close, this is a dessert flavour with fruit notes. A sugared pear acts as the base - reminiscent of a Japanese Nashi Pear. A creme brulee adds creamy depth to Cosmic Fog’s mix, with a dash of salted caramel added for good measure. 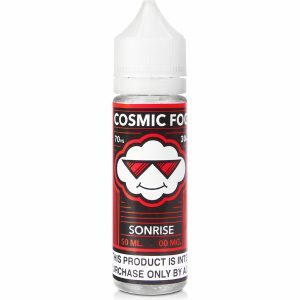 Sonrise eliquid will help you greet the day. A tropical flavour is the best way to explain Cosmic Fog’s blend. Passionfruit and pineapple create a sweet taste that plays towards tart when vaped at higher wattages. Finally, there’s a hint of kiwi creating a muted citrus aftertaste to tie the whole ejuice together. Milk and Honey eliquid will set your taste buds on a journey to the promised land. A splash of cold milk and marshmallow flavour are present from first inhale, on exhale a sweet and silky honey taste. When mixed, you’ll experience a honeycomb blend worthy of the Cosmic Fog name. Chilled Tobacco eliquid is a twist on a classic flavour blend, with a rich tobacco prevalent throughout, there is sweet note thanks to the chocolate, with a cooling menthol finish. Altogether creating a layered taste that’s different from anything else in Cosmic Fog range. Chewberry eliquid has a bubblegum flavour at it’s heart. 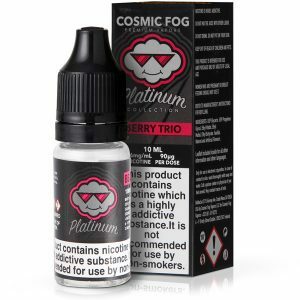 It’s further intensified by the ripe tasting strawberry adding some sweetness, this Cosmic Fog juice is balanced by a passionfruit flavour, giving this blend an altogether tropical feel. Sonrise eliquid will help you greet the day. A tropical flavour is the best way to explain Cosmic Fog’s blend. Passionfruit and pineapple creates a sweet taste that plays towards tart when vaped at higher wattages. Finally, there’s a hint of kiwi creating a muted citrus aftertaste to tie the whole ejuice together.